Jorden was born and raised in Cambridge, Ontario. Jorden attended the University of Toronto, where he specialized in Criminology and majored in Environmental Management, receiving an Honours Bachelor of Arts with High Distinction in 2013. 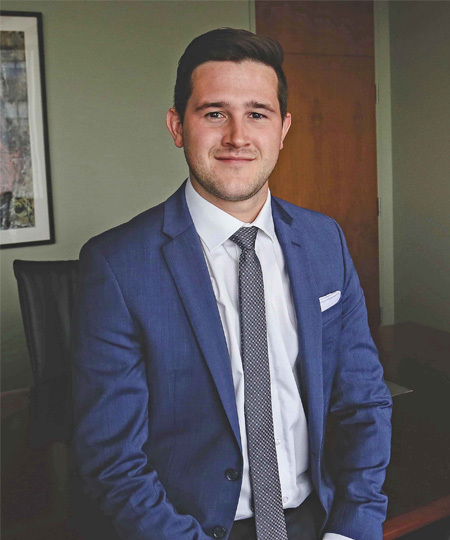 Jorden obtained his law degree from the University of Ottawa in 2016, and while attending law school, he participated in mooting competitions and volunteered at Law Help Ontario, providing legal assistance to low income persons for civil litigation matters. Jorden returned to the area for summer employment and to complete his articles with Giffen Lawyers, assisting in a full range of litigation and corporate matters. In 2017, he was called to the Bar of Ontario and joined the firm as an associate in their business law, real estate and wills and estates groups. When not in the office, he enjoys golf, baseball, and mountain biking, or checking out local breweries and restaurants. Jorden is a member of the Canadian Bar Association, the Waterloo Law Association, and provides consulting services at the KW Small Business Centre. Corporate and Commercial Law (including asset and share purchase agreements, incorporations, loans, tax planning, security agreements and other commercial contracts); Real Estate Law (including commercial and residential leases, commercial and residential purchase and sale transactions and mortgages); and, Estate Planning (including Wills, powers of attorney and estate administration matters).